Opening November 7th at The Art Center of Highland Park is, The Art of Influence: Breaking Criminal Traditions. This fine art exhibition, features the work of fifteen artists from around the country, calling attention to the ongoing ancient rituals that kill or maim millions each year—yet are not considered crimes. The exhibition utilizes the beauty of high-quality fine art to raise awareness of human rights issues and—in doing so—begin a dialogue that may encourage change. This provocative yet engaging exhibition debuted in 2013 at the IIT Chicago-Kent College of Law, putting the shadowy topics of honor killing, child marriage, acid violence—among others—directly in front of current and future law makers. Since the show debuted, new art pieces have been added. The show has evolved into the unique presentation designed specifically for The Art Center of Highland Park. Chuck Gniech is the curator of the exhibition featuring some fifty pieces of fine art, in a variety of mediums. Gniech points out that “The pieces selected for this exhibition are intriguing—with many levels of interpretation… Conscious of the human rights issues outlined by Executive Producer, Cheryl Jefferson, I selected beautifully intriguing works of art that contain multiple levels of meaning. Each piece was chosen to allude to the issues at hand… the meaning ultimately defined by the interpretation of the viewer.” says Chuck Gniech. 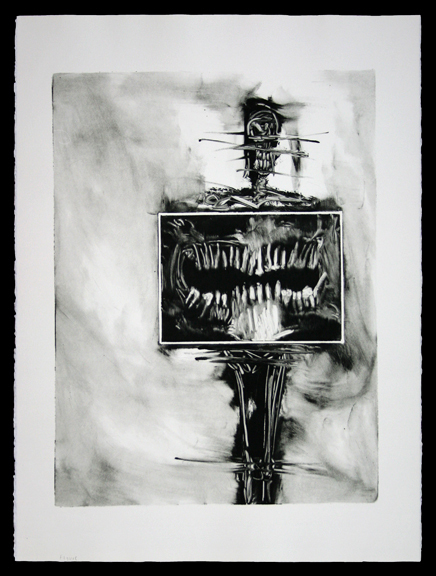 “For example, Silent Witnesses by James Deeb, is a 30×22” Monotype, that was developed from Deeb’s interest in medical and dental x-rays.” I found it appropriate for inclusion due to the implied content; the use of figurative abstraction with an emphasis on the bones of the mouth—a graphic image that alludes to the silencing of the repressed. Chuck Gniech has curated numerous fine art exhibitions with an emphasis on social justice. The Art of Influence: Breaking Criminal Traditions continues the string of shows that offer a visual exploration of human rights issues. This show is designed to begin a dialogue and raise consciousness, which is the first step toward preventing the continuation of these horrifying acts. This entry was posted in Openings and Events and tagged Art Center Highland Park, Chuck Gniech. Bookmark the permalink.